KATHMANDU, Jan 16: Only 5.65 percent of the foreign employment saving bond has been subscribed by Nepalis working abroad or those who have recently returned home from foreign employment, indicating that Nepal Rastra Bank's efforts to mobilize savings from migrant workers have gone in vain. 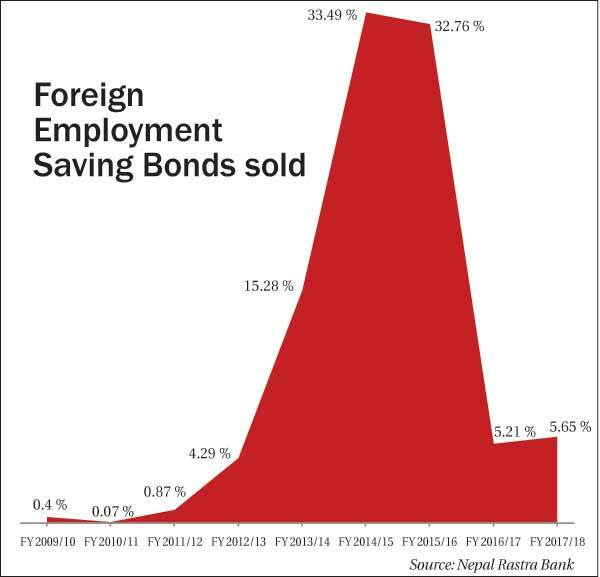 According to Nepal Rastra Bank (NRB), foreign employment saving bonds worth only Rs 28.2 million, out of Rs 500 million worth of bonds floated last month, have been sold. Subscription from overseas Nepali workers for this year is, however, slightly higher than the bonds sold in FY2016/17. In the last fiscal year, NRB sold Rs 52.1 million of foreign employment bonds out of Rs 1 billion worth securities reserved solely for migrant workers. 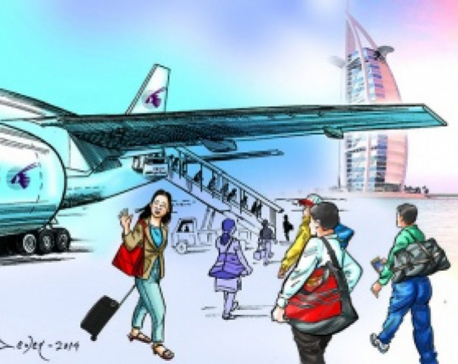 Though the foreign employment bonds are being issued every year, the instrument is getting lukewarm responses from Nepalis working abroad. The highest subscription rate for the bond was in FY2014/15 when the central bank sold 33.49 percent out of the total of Rs 250 million worth of securities. The central bank has been issuing foreign employment bonds since FY2009/10 in a bid to bring foreign currency savings of Nepalis working abroad through a formal channel and encourage them for investment in Nepal so that their capital can be utilized for 'nation building'. Though the central bank has offered 10 percent interest rate on foreign employment saving bonds, it could not attract migrant workers. The foreign employment saving bonds is one of the instruments that the central bank issues on behalf of the government to raise domestic debt for deficit financing of the budget. The government plans to raise Rs 145 billion in domestic debt for deficit financing of the budget worth Rs 1,278 billion. In line with the government's plan, the NRB has floated Rs 500 million of foreign employment saving bonds. Similar instrument will be issued twice in the current fiscal year to collect Rs 500 million of debt from migrant workers. According to the NRB, Nepalis or NRNs, who are abroad or have returned four months ago from the date of subscription notice, can apply for the bonds from their own name or from the name of their family members. The NRB has appointed sales agents for the foreign employment bonds in various countries like Qatar, Kuwait, the UAE, Japan, Saudi Arabia, Korea, Malaysia, Iraq, India, the USA and Israel. NRB officials attribute lack of awareness among migrant workers and their families to under-subscription of the bonds.